Following the basic edition, this article explains the details of special usage of SLE5000. Use it to the fullest ! In SLE5000, the spinning jet method of SLE2000HFO has been replaced with the oscillating valve method which uses a two-way (forward & back) control electromagnetic valve. As a result, the shape of HFO waveforms changed from a conventional sinusoidal curve to a square. According to the manufacturer’s test, SLE5000 is capable of delivering more VTHF and eliminating CO2 more efficiently than SLE2000HFO if operating at the same settings. With a constant flow through the inspiratory limb increased from 5 to 8 LPM and a high powered oscillating valve equipped, HFO performance is intensified in this model compared to SLE2000HFO. Also, a flow sensor at mouth enables the measurement of VTe (expiratory tidal volume). The target of setting for HFO is VTe of 1.5～2.0mL . In SLE5000, ventilation parameters can be pre-adjusted before determining a ventilation mode except dP (delta pressure, i.e. amplitude), which can be set only after HFO is started. The pre-set value of dP is 4cmH2O. In SLE2000HFO as well as the preceding version of SLE5000, an MAP setting tended to rise as a dP setting is increased. This tendency has been corrected in the current SLE5000 version. In the current version, an MAP setting changes only temporally, following the adjustment of a dP setting. Therefore it should be noted that changing an MAP setting after a dP adjustment as in the older versions may result in an incorrect MAP setting in the current SLE5000. VTHF is not indicated in the HFO+CMV mode. In previous models, PSV cycling off (=termination of expiration) did not operate when a cycling off threshold was exceeded by a leak flow caused by a large leakage from the airway tube (Fig.1-b). In the new version, when a leak flow significantly goes beyond a PSV cycling off threshold (=threshold to terminate expiration), a ventilator automatically readjusts PSV to be cycled off at the level of the leak flow (Fig.1-c). Though Babylog®8000plus also has a similar compensation function, unlike SLE5000, the system redefines a new threshold based on a flow line which has risen due to a leakage. Automatic PSV cycle off compensation in SLE5000 works properly only when 1) a leak flow is 5LPM or less and 2) a leak rate is 50% or less. SLE5000 shows a unique behaviour at the time of apnoea during PSV. PSV is a ventilation mode which triggers both inspiration and termination of expiration. In case of Babylog®8000plus, when a patient develops apnoea during PSV, the ventilator delivers backup mandatory breaths based on a pre-set respiratory rate but the inspiratory time is adjustable because termination of expiration is still operative (Fig.2-a). On the other hand, in SLE5000, expiratory termination of mandatory breaths becomes invalid during apnoea and a unit delivers mandatory breaths for a set inspiratory time. 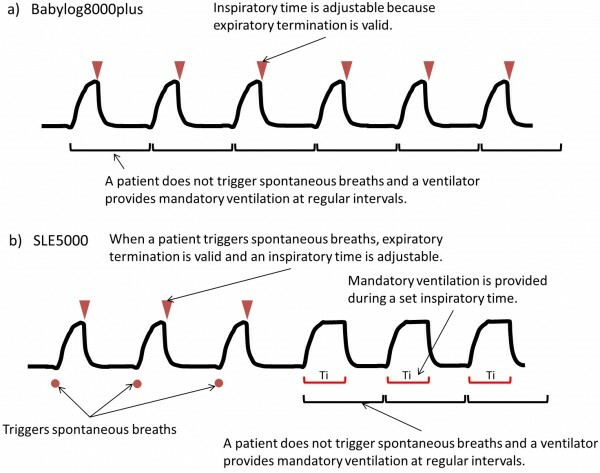 In other words, when a patient triggers inspiration, expiratory termination is valid whilst when a patient fails to trigger inspiration (≒apnoea), termination becomes invalid (Fig.2-b). Generally speaking, a neonate who falls into apnoea requires slightly higher ventilatory settings than those who breathe spontaneously. Therefore, in SLE5000, even if maximum inspiratory pressure is kept constant, setting the inspiratory time somewhat longer will result in better lung recruitment during apnoea. When recruitment effect is expected during apnoea, an inspiratory time should be set slightly longer. The writer often sets a maximum inspiratory time during PSV at 0.5 to 0.6 sec. In the PSV mode, valid expiratory termination means a patient triggers a spontaneous breath. However, invalid expiratory termination does not necessarily mean that a patient is in apnoea. For example, when a backup rate is set significantly higher than a spontaneous breath rate, it is probable that a ventilator delivers backup breaths before a patient breathes spontaneously. Especially with a longer inspiratory time as described earlier, there is a risk of patient-ventilator dyssynchrony (fighting). 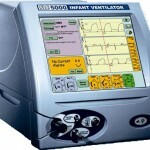 In the TTVplus mode, a ventilator delivers gas of a set tidal volume (VT). During TTV, an inspiratory pressure and an inspiratory time are adjusted so that a tidal volume of each breath will reach the target expiratory tidal volume (VTe). 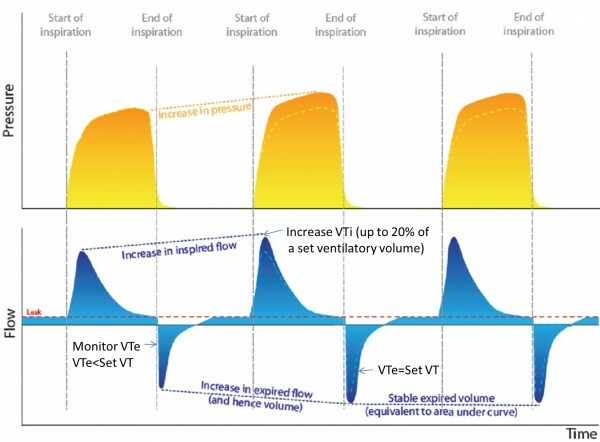 In the previous version of SLE5000, the target was not VTe but an inspiratory tidal volume (VTi) and a significant gap often occurred between the setting and VTe when there was a leakage, which is dealt with in the current model. Also, a function of leak compensation within a range of 0～20% is added in the TTVplus mode. While there is a leak, a unit increases an inspiratory tidal volume (VTi) up to 20% and compensates the leak. Even without a leakage, leak compensation should be set at 15% or more during TTVplus for stable operation. There are several points to note while using TTVplus. Please find the list below. * If spontaneous breathing is intense, no pressurisation occurs and the mode ends up as CPAP. * The tolerable level of leakage is 20% or less for a ventilator’s normal operation. * If the pressure upstroke is slow, a ventilator may apply pressure which will not achieve max PIP or max Ti, failing to reach a set tidal volume. 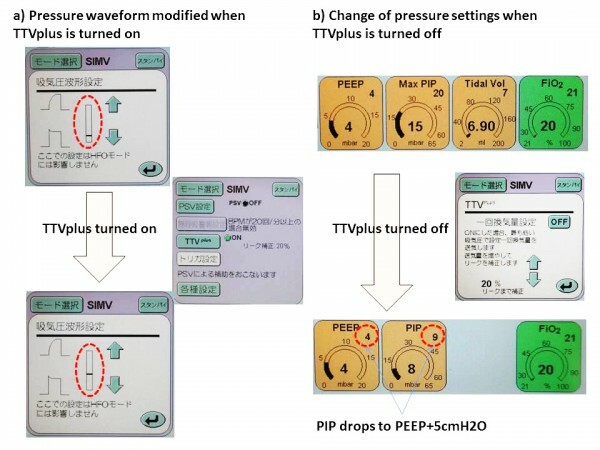 * When TTVplus is selected, the pressure upstroke may turn slow. Therefore, when changing the mode, it is necessary to confirm and reconfigure the waveform (Fig.4-a). * When TTV plus is turned off, PIP will drop to 5cmH2O plus PEEP. PIP readjustment will be necessary (Fig.4-b). * When combined with PSV, an expiratory termination threshold takes priority and consequently, a set tidal volume may not be achieved. * When combined with SIMV+PSV, the PSV pressure level for SIMV is set according to the PSV setting made in TTVplus which is a percentage of the SIMV pressure.